The right draperies or window coverings are integral to completing a room’s look. They should complement the colours and atmosphere of their room with not only their colouring, but their material as well. A warm and cozy look can be easily undone by sterile shutters or blinds, while a trendy, modern room has no place for pillowy elegance. At Sage Furnishings, we offer a large variety of drapery fabrics and hardware so you can create the precise look for finishing your room, alongside a wide selection of blinds and shutters. With leading brand names from North American manufacturers like J. Ennis Fabrics and MaxxMar, as well as expert advice and service by our interior design experts, Sage Furnishings can help find you the perfect window covering. 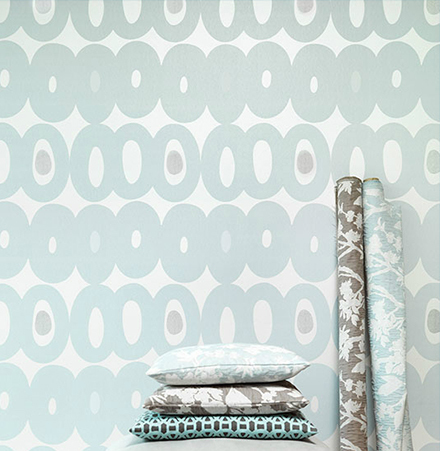 Sometimes the right design calls for patterns rather than paint, and a durable wallpaper is the answer. Hung properly, wallpaper provides lasting coverage, often longer than paint, and creates wonderful, textured looks that can help reinforce the style of your home. If you’re after a unique look that can only be accomplished with papering, talk to one of our interior design specialists. We can find you the right paper and pattern to match your design and personal style, and often a price points better than competitors.